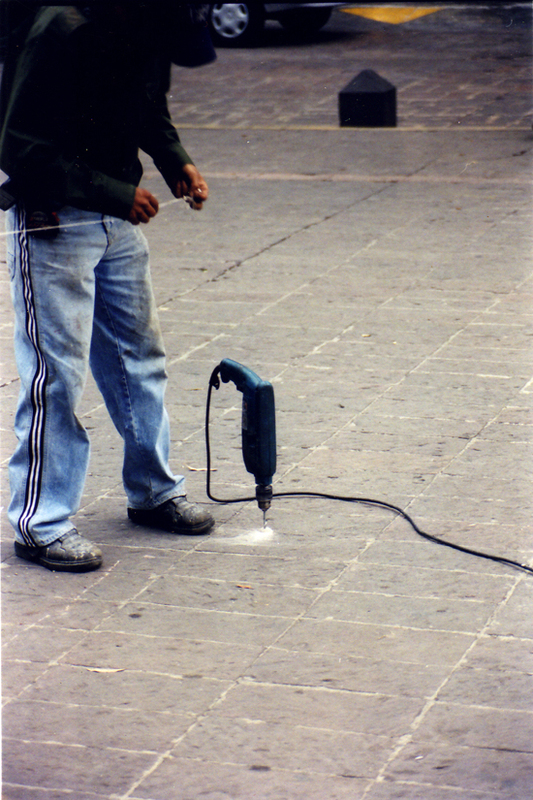 Site-specific solo exhibition at Museo de la Ciudad, Mexico City, 2002–2003. 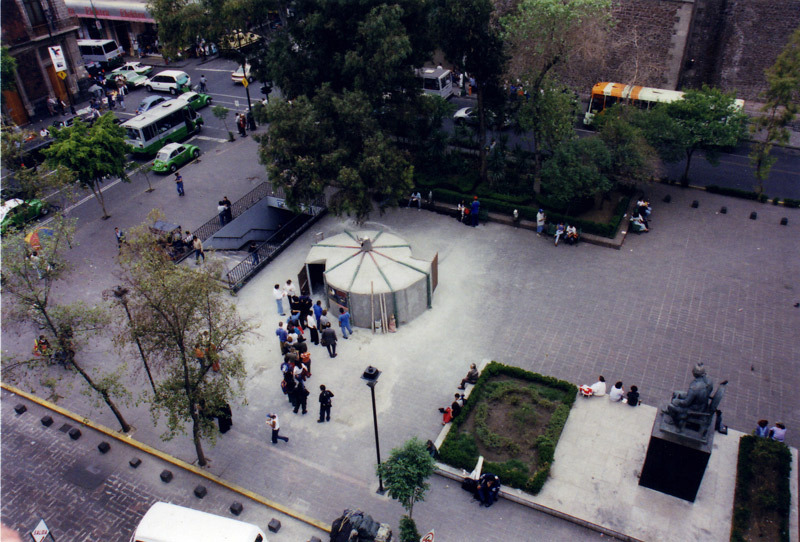 Camera Obscura was a site-specific installation, built in a central plaza in Mexico City. The exhibition was a light-tight building with a lens system in the roof of the structure, which projected a live image of what was happening in the plaza outside onto a flat surface inside of the space. The installation functioned like a giant human eye, taking in light and projecting an image, through the use of mirrors and lenses. In a camera obscura, light enters a light-tight space through a small opening, hits a mirror, travels through a system of lenses, and becomes a projection. In this case, the image was both inverted and magnified, and projected onto the floor. I developed a lens system for the camera, which was capable of creating a projection within the conditions of an urban environment. The camera was able to reproduce images in motion, at close range, and in the dark. The camera was open to the public, free of charge, for one year. 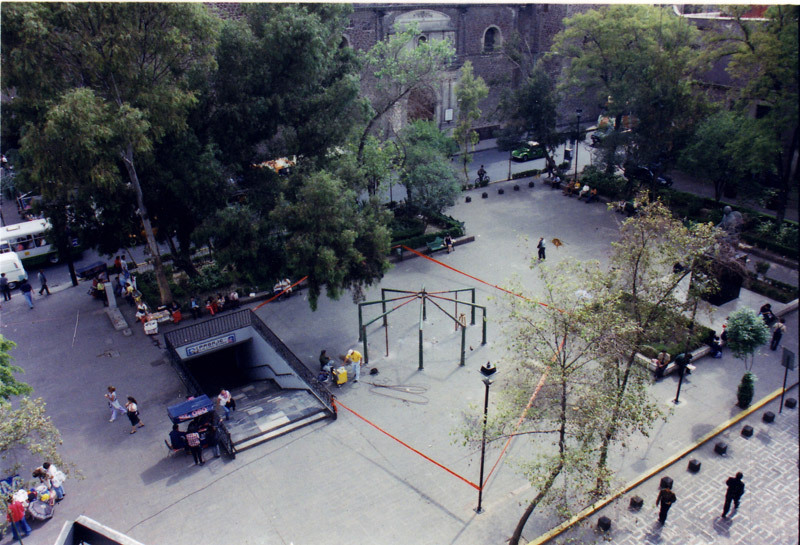 In 2001, I was invited by the Museo de la Ciudad to create a public, site-specific installation in Mexico City. The installation was located on the Plaza Primo de Verdad, one of the most central and historic plazas in Mexico City. Traditionally, a camera obscura is built on a hill or cliff, and is designed to see to infinity. I proposed an urban camera that would be able to capture and reproduce the image of the constantly moving city center. I developed the optics for this camera with several professors from the Universidad Nacional Autónoma de México (UNAM), and together we were able to create a system that could see down into the subway, in conditions of light, pollution, and smog, while maintaining focus in each area of the image, even though the camera was focused on a constantly shifting scene. The camera produced a moving picture in real time, which had no grain, needed no development, and had no permanence. The structure that housed the camera was built primarily out of debris from the Mexico City’s Department of Maintenance and Public Works salvage yards. 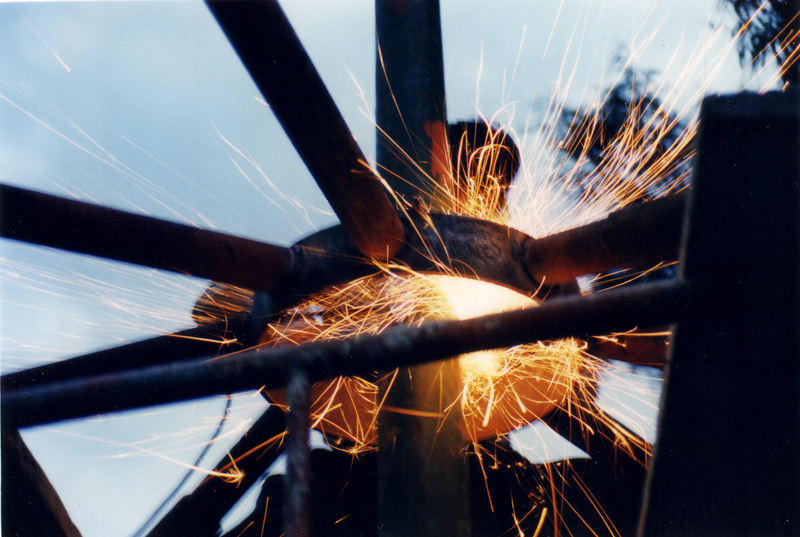 Discarded lampposts were cut and re-welded to create the skeleton of the camera’s housing structure. Many of the members of my building team were city workers and architects who also built Mexico City’s freeways and streets. The piece created a quiet place to view the continuity of this bustling public space, focusing on a single image at a time. Viewers were able to maneuver the camera’s “eye” to capture various views of the surrounding streets near the museum, which created an opportunity for each visitor to engage and interact with the ongoing performance of the city itself. The plaza, where the camera was located is the site where Hernán Cortés first met Moctezuma—the initial site of the Spanish conquest of the Aztec Empire. This site, like many others in downtown Mexico City, has functioned historically as a space of cultural collision in an ongoing history of conquest, colonization, and social impositions, which are continually being rewritten.